iPhone-iPad | Ferruh Erdoğdu, Ph. D.
We started developing iPhone – iPad applications for food engineering education last year. 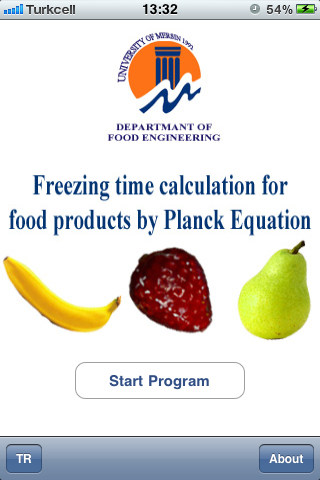 Our first application on determining the freezing time of food products using the Plank equation is now available from AppleStore (search name: iFreezing). The program runs smoothly in iPhones and iPads (in both Turkish and English). It was developed with two students from food engineering department (Sukru Mert Soyumert) and Burak Lafci in 2011. This was their graduation project. Interested visitors are wellcome to download this program from Apple Store for free. Our second iPhone-iPad application is on determining the thermodynamic properties of refrigerants to help the students taking Thermodynamics and Food Processing classes. This application was developed with Umut Onur as his graduation project in 2012. I was planning to make both these programs available for free download in Apple Store, but unfortunately, I had to renew my membership every year. Hence, I will wait to renew it until we several more programs.